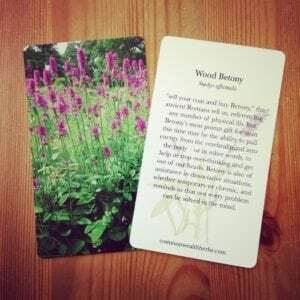 Wood betony is our Herb of the Week this time, and for this one you’ll want to make sure you check the botanical name, because there’s at least one other popular and important herb who goes by the common name “betony”. In this case, we’re referring to Stachys officinalis. (In some older texts you’ll see it referred to as Stachys betonica or Betonica officinalis.) The “other” betony is any of a number of Pedicularis species plants, sometimes also known as louseworts. 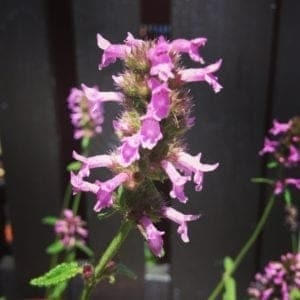 If you live west of the Mississippi, you may encounter Pedicularis in herb shops simply labeled as betony, whereas in the East it’s Stachys who tends to claim the name. So, always check the Latin to make sure you know who you’ve got – though of course that’s always a good idea! That said, these herbs do have some things in common! Both are helpful for anxiety, tension, and mental discomfort that leads to dissociating the mind from the body. Pedicularis helps by profoundly relaxing the musculature, which in turn leads to a calmer mind. Stachys has more of a re-centering effect, moving the seat of perception down into the body. The first thing we think about when it comes to betony is its amazing capacity to bring the mind and the body into greater connection. It is one of the best “grounding” herbs in our entire materia medica. When people are uncomfortable in their own skin, whether due to abuse, trauma, negative self-image, or simply a lifetime of feeling not-good-enough – and who doesn’t, when surrounded by airbrushed advertisements? – there’s a tendency to pull the mind away from the body. The mind becomes a passenger in the body, like a pilot in one of those giant robots that fights the space monsters in the movies: you’re just pulling levers and pushing buttons, and the body walks around like a puppet. Betony lets you relax and settle in, helping you feel more at home in your body. It’s not only trauma that causes this disconnect. Here in Boston, many of our students & clients work in the tech industry or in academia, pursuits which tend to amplify the “airy” qualities of abstract thought and schematic conception, but distance us from our bodies. If you “fall into the computer” at work or “lose time” while chasing down a thread of thought, betony can bring you back to the real world of physicality and presence. We’ve found betony to be incredibly useful for people who work heavily with machines or computers, to bring them back out of the realms of artificial intelligence and virtual experience. A simple tincture or elixir of the aerial parts (leaves & flowers) is all you need – for most people, a dropperful taken 3-5 times a day, plus as-needed, is a good dose to begin with. 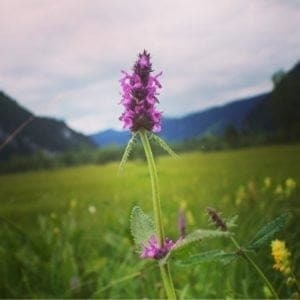 Betony is a great herb for headaches of all types – tension, migraine, cluster, hormonal, you name it – due both to its downward-drawing directionality and its capacity for releasing tension in constricted muscles, particularly those of the head and neck. Betony is a traditional remedy for epilepsy and seizure disorders, as well as spastic conditions characterized by tremors and shaking. 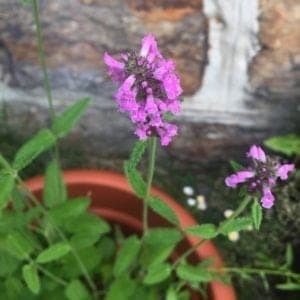 Betony is also useful when your mind (not just your head) is aching, tight, or unsteady. This herb is a reliable helper for all kinds of mental health issues, small to large – and it’s most effective as part of a larger holistic protocol, especially one which includes movement and exercise. Likewise, if we only took one herb and left it there, the job isn’t fully done. You might not be fully satisfied with your results if you just drink a cup of tea! Imagine instead a protocol “real” movement – doing fun things, out in a natural environment under the sun, together with some friends – plus some nice betony iced tea to pass around! – and now you are on your way to building a much stronger resposne to negative emotions and mental health issues. We’ve been focusing on betony’s nervine relaxant, body-inhabiting, and headache-relieving actions so far. Let’s not pigeonhole betony, though – it’s not “just” for head-centered problems! A gently bitter mint with a mild diffusive action, wood betony is also helpful when impaired digestive function causes headache, anxiety, and restlessness. Mildly carminative, wood betony improves digestion, dispels gas, and gently stimulates the production and release of bile from the liver and gallbladder into the digestive tract. These effects are mild in betony, but you can enhance them by pairing with stronger digestive herbs such as sage, lavender, or peppermint. Through inducing relaxation at the skin surface, betony allows the heat of fever and agitation to escape the body – it’s one of our relaxing diaphoretics, like elderflower and linden flower. Betony’s a decent vulnerary, too! Many other Stachys species are known as “woundworts”. Soaks, compresses, and poultices are appropriate administration methods for those effects. How do you work with betony? PS: We have a full video + text herbal monograph on betony (and 86 other herbs) in our Materia Medica course, which you can take stand-alone or as a component of our Herbalism 101 program.